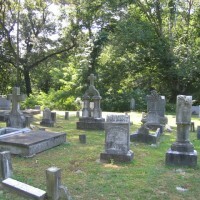 Ivy Hill Cemetery was created in 1886 as a private cemetery to serve the residents of Smithfield and Isle of Wight County. The land was originally part of the T.B. Wright farm until it was laid out as a cemetery along the slopes of a small peninsula of land overlooking the Pagan River. The roughly fourteen acre cemetery utilizes a plan which flows with the existing curves and rolls of the land. Grave markers vary from quite simple early examples to more detailed and articulated styles. 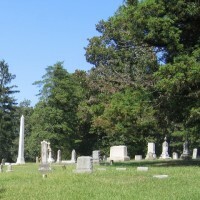 Many of the leading citizens of area are buried at Ivy Hill, including some mid-nineteenth century graves which were moved to the cemetery when it first opened. It has been, and continues to be, the burial ground for many of the area’s prominent citizens. The cemetery was found significant under Criterion C (Landscape Architecture) as a fine example of a local cemetery influenced by the earlier “rural” cemetery movement, and Criterion Consideration D (Cemetery) because of its gravesites of persons of local and regional importance.